Along with the AGM, the January club meeting is also the point at which the trophies are awarded to their new owners – temporarily at least, they’ll have to give them back next year, unless they win again! For 2015, we had new faces all around. Rob French won the main competition trophy having collected the most points over the course of 2015. The competition is run every other month – each club member can enter up to two models and everyone gets a single vote to pick their favourite of the bunch. One vote equals one point and the member with the most points after the final competition month in December is the winner. For 2015 it was Rob, who has plenty of years left in him yet to carry on wow-ing us with his brilliant, innovative dioramas and ideas! The main club Competition Trophy for 2015 is presented by Sam Evins, club secretary (left) to the winner Rob French (right). 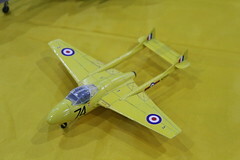 In addition, the Most Inspired Modeller Award, a trophy that recognises special effort, improvement and/or overall passion for the hobby was jointly awarded to Tony Gill and Craig Wilcock. Tony has built many kits over the years, including many cars, but his real passion is boats, and his hand made efforts are always mightily impressive. Craig’s passion is armour and he’s produced some very fine work over the course of last year and so both are deserving winners. The Most Inspired Modeller Award for 2015 is presented by Martin Aris, club chairman (centre) jointly to Tony Gill (left) and Craig Wilcock (right). Congratulations to all three winners from everyone at the club! All richly deserved, and now it’s time for the rest of us to try and get our own paws on those trophies this time next year. The bar has been raised! As an IPMS-affiliated club, IPMS Middleton Cheney is required to have a committee team that manages the club and who carry out the organisational day-to-day activities. The positions on the committee are elected every year at the AGM, held during the January club meeting. At least one of these chinless wonders will be at every event the club attends, and more often than not all five of them will be there, causing havoc! All are more than happy to answer questions on the club and provide any information required. If you would like further information on the committee or the club, please visit the contact page. IPMS Middleton Cheney is a friendly and informal model club based in the village of Middleton Cheney, South Northamptonshire. The club maintains a more light-hearted approach towards the hobby, and actively supports all abilities, believing that if the model looks good to you, then it’s good enough for us! Alongside newcomers, the club benefits from having specialists in most categories. So if you want to know the right shade of green for a 1942 Eastern Front ME-109, or the correct panel shades on Enterprise D we can help! Founded in 2005, the club is made up of members from around the Banbury area, indeed an early name for the club was the Four Shires Model Club, owing to members living in the counties of Oxfordshire, Northamptonshire, Warwickshire and Buckinghamshire! 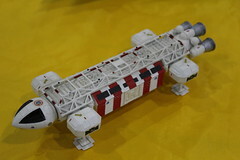 Later on the name was changed to the Middleton Cheney Scale Model Club and then in 2012, it became affiliated with the International Plastic Modellers Society (IPMS) and thus joined an elite group of clubs to carry the IPMS moniker. In 2018 we returned to Telford for a second time, debuting a pub themed display, using bottles of alcohol and models related to them. It was very well received, and we ended up scooping third overall in best club display. It was subsequently decided to tour the pub theme around the shows the club attends in 2019. We have a helpful, friendly committee team of five that run the club alongside a growing membership that specialise in a wide variety of genres, of all ages and levels of ability. 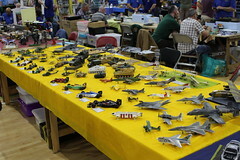 Each year the club runs a competition, open to all members. Read more about it, including a list of previous winners, at this link. If you’d like more information on the club, go to the contact page and get in touch! Where does IPMS Middleton Cheney meet? IPMS Middleton Cheney meets once a month, at the Parish Meeting Rooms in the village of Middleton Cheney, east of Banbury and M40 J11. Meetings begin at 7pm and usually last until between 9 and 9:30pm. However, feel free to come and go at a time that best suits you if you can’t stay for the full duration. Many of the club’s members are shift workers and we try to accommodate meetings to fit in as best we can. Normally however you can expect each meeting to be on the second or third Thursday of the month. To be sure though, check Facebook for the latest updates on when the next meeting will be!